You’ve arrived in Athens and are ready to eat your way through the city. The options are endless but we can read your mind: you’re in search of some good Greek souvlaki. You’ve probably already tasted it in your home city, but now you want to try the real thing, which we agree is essential while you’re here. On the other hand, if you haven’t heard the word “souvlaki” before, then just know it is a popular Greek fast food/street food, consisting of small pieces of meat (and sometimes vegetables) grilled and served on a skewer or in a pita wrap, and it’s delicious. Is souvlaki our national dish? Probably, as most travellers on our tours ask us about our favorite souvlakia places in town. Which is why we’ve managed to put together a pretty comprehensive list of where to get it. To help you feed your souvlaki needs, here are some recommendations for where to taste the best versions in the centre of Athens. Bairaktaris is a very well-known traditional Greek tavern that has been run by the same family since 1879. The popular spot serves delicious grilled meats and probably some of the most famous souvlaki in the city. Located in Monastiraki Square, it’s very easy to find and it won’t let you down. Moreover, the place looks special with its painted wine barrels and photos of the famous Greek personalities who have visited the tavern throughout its long history. Right next to Bairaktaris Tavern you’ll find Thanasis. Serving up souvlaki since 1964, this place is always busy, but service is fast. Portions are large, so come hungry, and prices are reasonable for the amount of food you’re getting. Meat is grilled perfectly no matter what you order at Thanasis, but kebabs are the specialty here. Savvas has a long tradition of serving well-grilled and absolutely delicious meat. They have a wide variety of dishes and traditional appetisers to choose from, but of course, you’re here for the souvlaki. 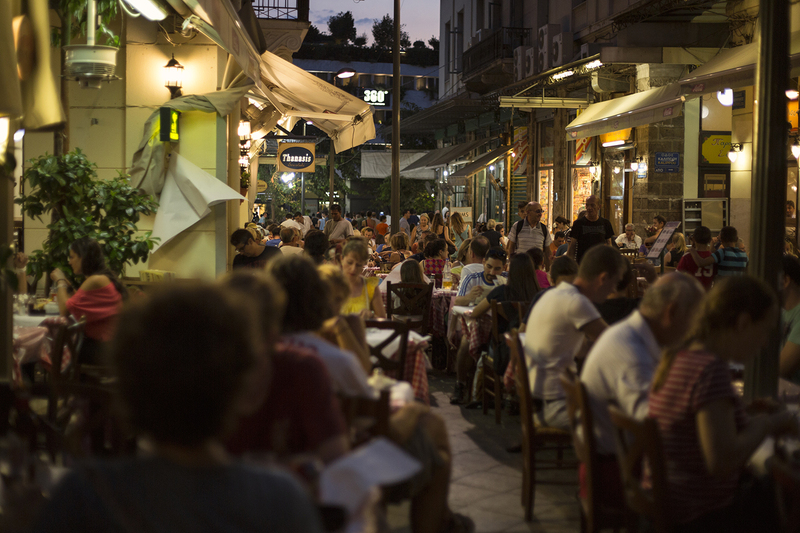 Located right next to Monastiraki Square on Ermou street, this is a 24-hour restaurant so you can get your souvlaki fix any time of day or night. Savvas also has a rooftop garden bar with a great view of the Acropolis, making it an amazing choice during the summer months. Very close to Monastiraki Square is Agias Irinis Square. This charming square is filled with bars and cafes, among which you’ll find Kostas, a no-frills, family-run spot serving some of the bets souvlaki in the city. Keep in mind that this isn’t a sit-down restaurant, just take-away. Sometimes you might find some tables outside, but most of the customers order and then eat outside, sitting anywhere around the square. Very close to Thiseio metro station, just about two minutes on foot through Adrianou street, you’ll find a place where you can enjoy your souvlaki with great views of the ancient Athenian Agora. I would describe Souvlaki Bar as a more modern version of a traditional souvlaki place, but the food doesn’t disappoint. For something a little different, you can try the “souvlaki shots,” five shot glasses containing five different kinds of mini souvlaki. Many young people hang out here and the atmosphere is relaxing. Hungry for Athens? 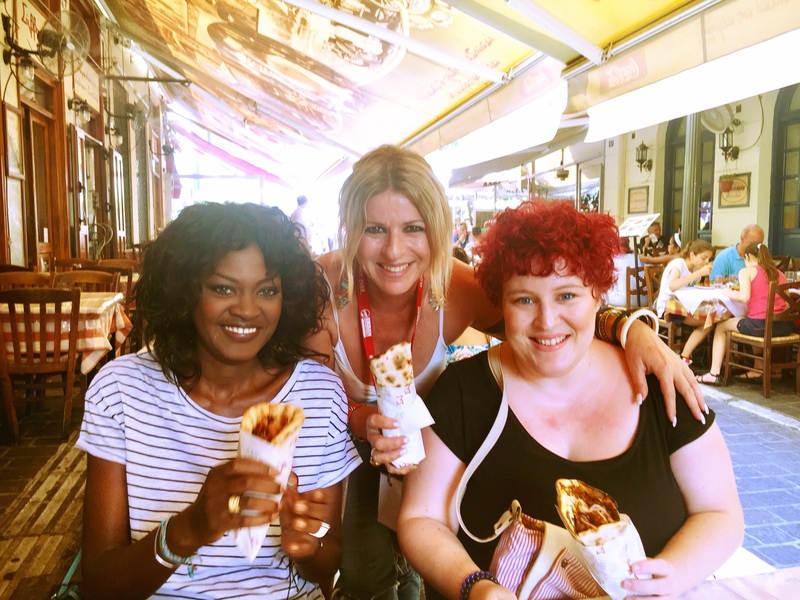 Come feed your travel soul on our Taste of Athens tour!